Today Miss Hwang and Mr. Lee took me out to lunch. Yesterday I was hungover for most of the morning, so they wanted to introduce me to one of Korea's "hangover soups," or hae-jang-kuk. This one was made from blowfish, bean sprouts, peppers, onion, garlic, and some spices. It was delicious. 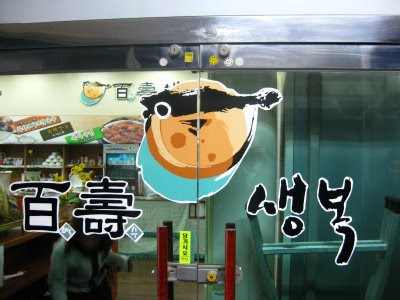 One of the better side dishes was also dried skin from the blowfish, seen in the lower right of the picture.